Mid-November found me at the Oregon coast with my major goal for a day trip having been marked off early: locating and photographing the tundra bean-goose which had been spotted the previous week at Nestucca Bay National Wildlife Refuge. (Be sure to check out Part 1 to learn more about my wild goose chase and see the pictures!) The day was windy and cold, but beautifully clear. Already at a wildlife refuge, I decided to continue my coastal birding adventures right where I stood and to travel south from there. 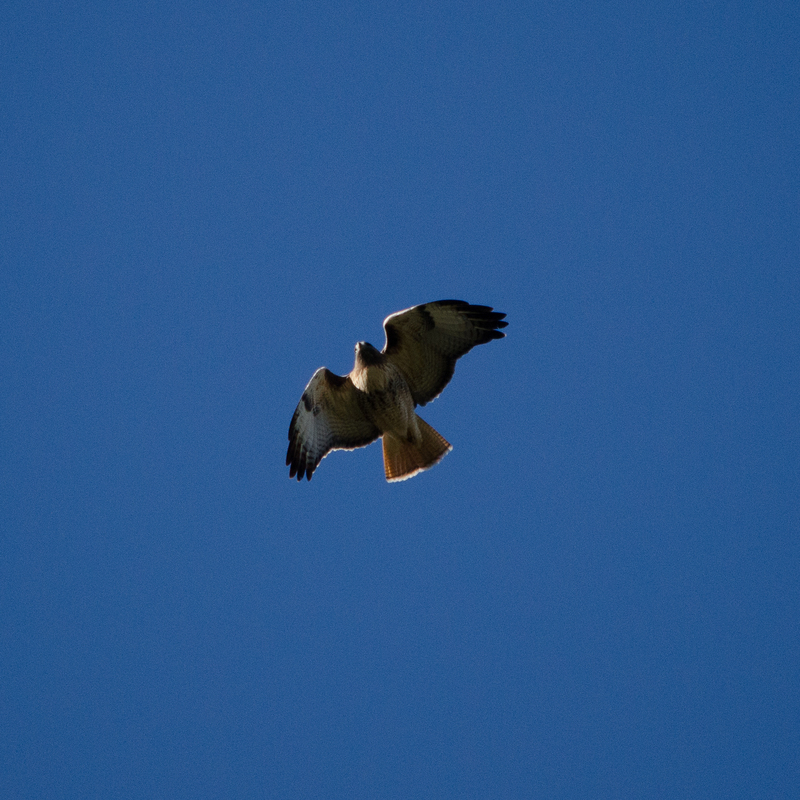 All in all, it was a very productive day of birding resulting in hundreds of pictures. This post will focus specifically on the refuge, to keep things manageable. 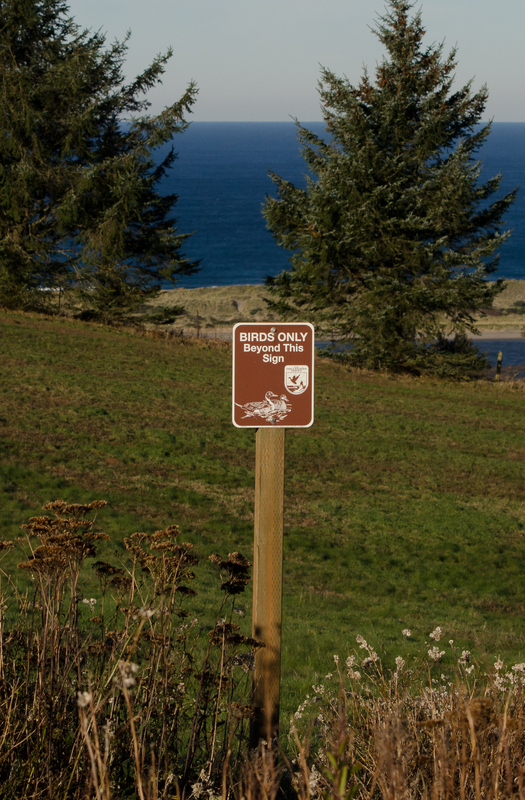 Nestucca Bay NWR is located just south of Pacific City, Oregon (which if you are both a bird and a beer enthusiast is worth visiting for Pelican Brewery). Several different habitat types exist within the refuge, including rare coastal prairie which is currently going through restoration. Birds are clearly a priority of the refuge. The lower parking lot has a viewing platform which overlooks pastures below (and where the tundra bean-goose had been spotted), and it was from here that my visit began. It was only about half hour after sunrise and although bird activity was obvious, for the most part it was not yet photo-worthy, and so I trekked up the Christensen Road/Trail to the second lot; it’s approximately a half mile uphill on a gravel road through shrub and forest. It looked promising, but the light was poor. While traveling by foot uphill, I spotted bald eagle, red tailed hawk, northern harrier, varied thrush, American crow, American Kestrel, song sparrow, black-capped chickadee, and a possible peregrine falcon (the view wasn’t great and I could not get a picture, so I’m not confident on my identification). Achieving the upper parking lot unveiled fantastic views in all directions, and almost too-bright bird photography conditions. I stopped to chat with another birder who had come from northern Washington, and while we were observing the area a huge flock of pine siskins came into view. I was excited, as I am quite fond of these little birds and had not yet seen any this year. 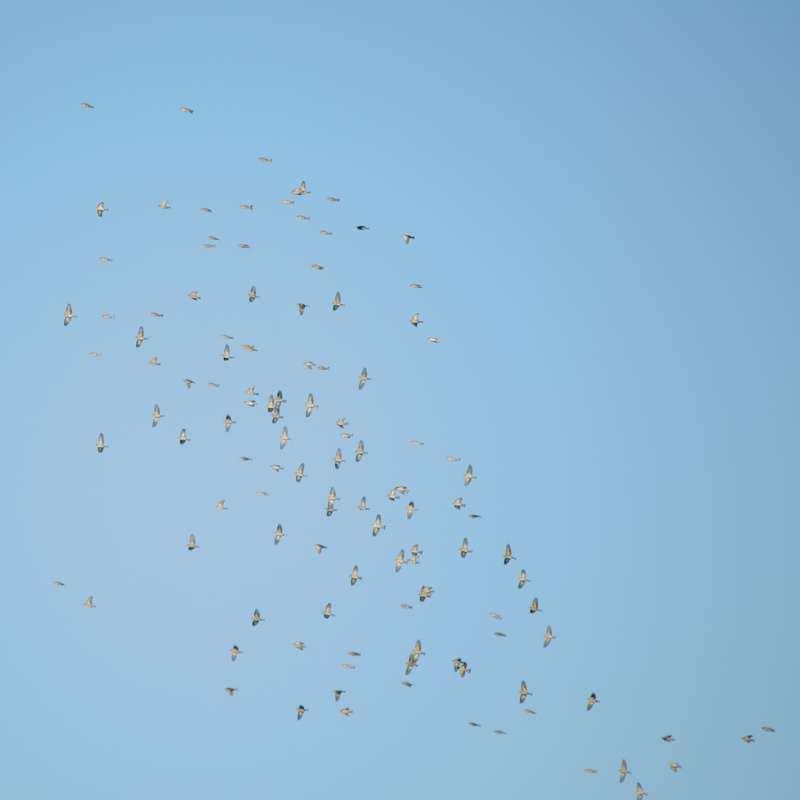 I would say there were about 100 in the flock, but they moved quickly and it was hard to capture them all in a single image! I saw them several times while I was up on the hill. A much smaller group of birds also flew neatly into my camera’s view, as four killdeer noisily made their way past. These orange-eyed plover have a very distinctive cry, making them easy to identify as they seem to call their own name. Walking up the Pacific View Trail to the observation deck at the very top of the refuge, I stopped near some brush when I heard a song sparrow and a familiar rustling of leaves from the small bird’s foraging. Although very common place, I always stop for song sparrows as they often mingle with other species. 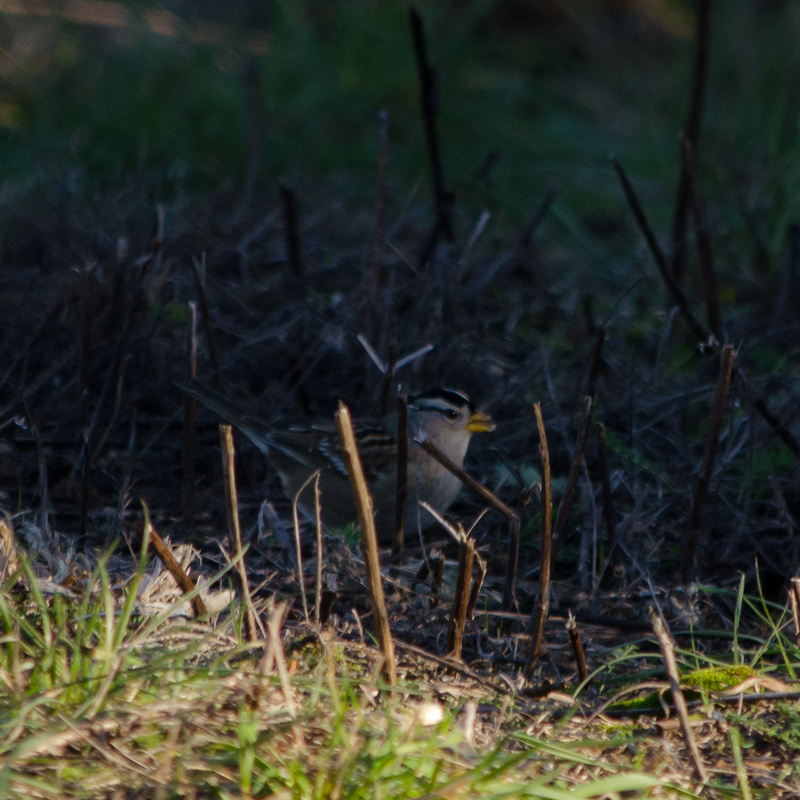 This was no exception: right along with the one I had first heard, I spied a white-crowned sparrow among the grass. After taking in the view and watching the pine siskins flash around the prairie for a bit, I made my way back down. 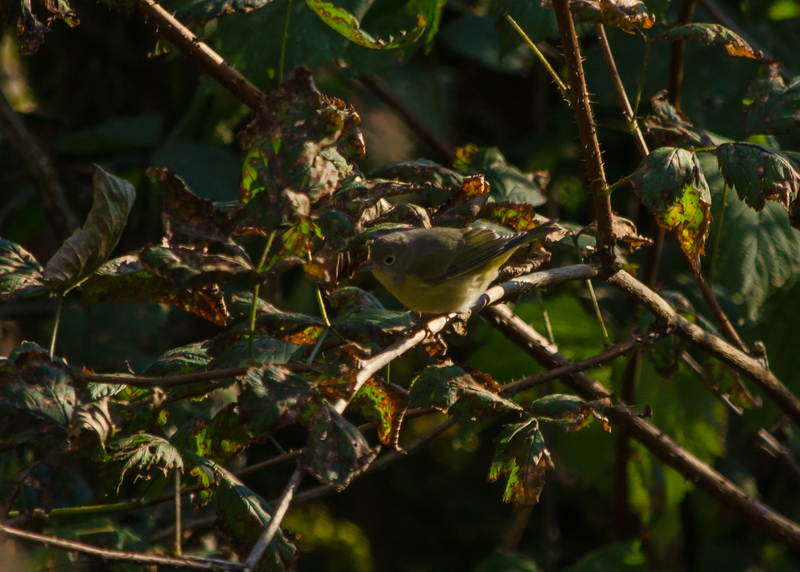 The same birder I had been chatting with previously came down the trail shortly after me and caught up as I stopped to peer after some too-quick golden-crowned kinglets in the shadowy brush. Gold crowned sparrows, Bewick’s wren, black-capped chickadees, and chestnut-backed chickadees were also in the area. 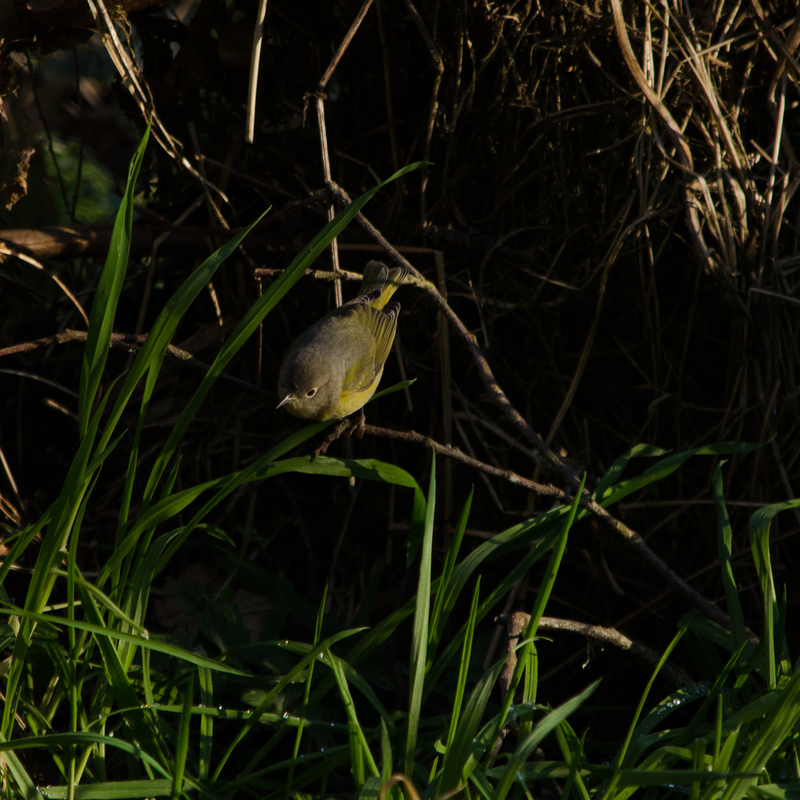 While we talked a moment, a flash of yellow appeared below and he quickly identified it as a warbler. The speedy little creature fluttered around below us for a few minutes, flicking in & out of view amid the brush and grasses under the shadows of the trees. 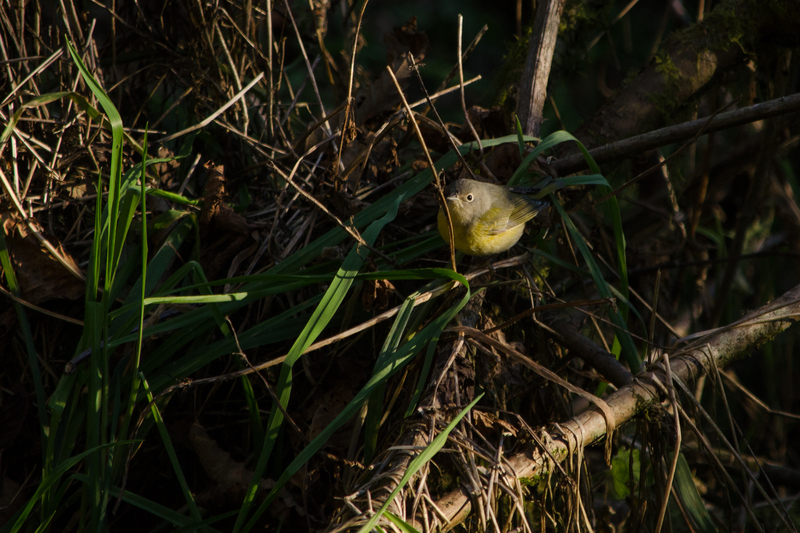 With an obvious gray head, olive back and wings, yellow belly, breast, and throat, and no distinct markings except for a pale eye-ring, we were able to determine (back down at the parking lot, with the aid of a field guide for confirmation) that this was a Nashville warbler. These small birds do nest in the area, but typically migrate south for the winter and it was a definite surprise to see this bird. 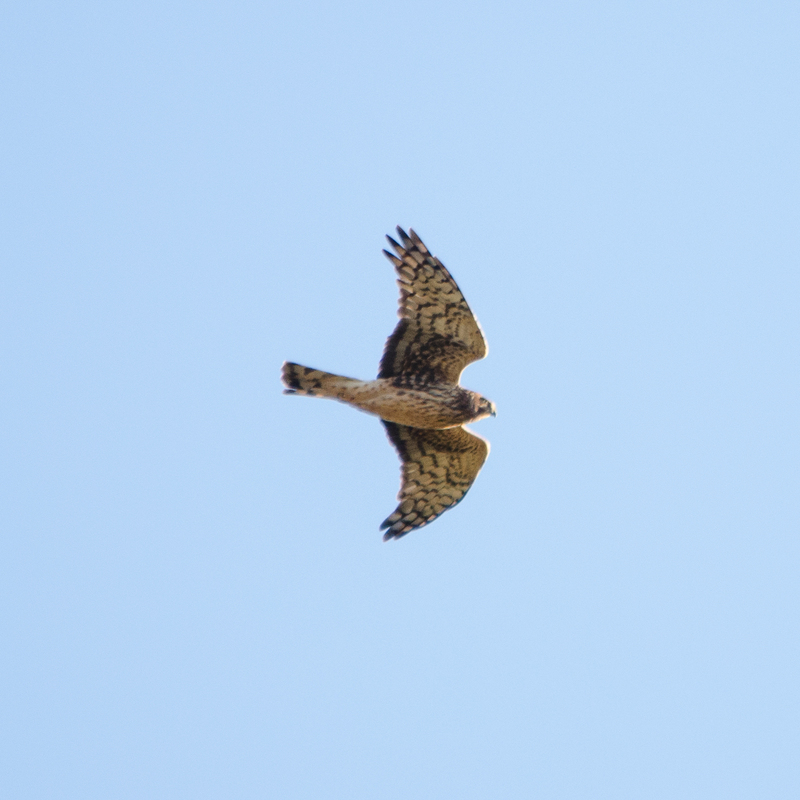 Even in the summer months, this looks like the northern-most range for this bird along Oregon’s coast. To see more pictures from this leg of my day trip, and other outings, check out my Flickr site. Be sure to check back for Part 3 and my journey South along Oregon’s coast. Comments are always welcome!